Dimensions: 60 x 26.5 x 34"
America's First Steam Cleaner, since 1927! Your choice, 115V or 230V same charge! Featuring max output of up to 200 PSI (running range 100 to 200 PSI) a 50 foot long hose, industrial pressure wand, chemical injection and super heated wet steam up to 325 F. Put on the fan tip for a wider blasting pattern or the focus nozzle for intense, focused cleaning. Tips are quick disconnect and store right on the side of the unit. This is no toy! Units weigh from 360 to 450+ lbs depending upon model. Clearly these are super duty machines. 100% American made, and might I add, done with pride. If you don't mind a some water, then this is a fantastic unit. See optional configurations below. More water flow = more power = faster cleaning. Need more GPH or PSI? We have units up to a massive 10 GPM! Call for more information! Units come standard with a 5' long safety wand. Shorter was are not available. Water Flow: An Example of how much is 1.17 GPM is: Remember, GPM means gallons per minute and GPH means gallons per hour. With that in mind, a common household garden hose puts out about 3 to 4 GPM or more. If you ran our 1.17 GPM unit (SJ-70) for a full hour you will use about 70 gallons of water. Remember, most cleaning is not non stop so a typical hour at work would use even less. If you ran a garden hose for a full hour you would typically use close to 240 gallons or more. The SJ70 uses far less water then washing a car with a garden hose, yet its PSI, and steam thrust does the job far better and faster. Don't forget the built in on demand detergent system. When you compare using this power house with a garden hose you find the SJ-70 can use as much as 3.4 times LESS water than a garden hose! This is a great high speed, low water option for cleaning cars. This hot wet steam also cleans a car much faster then traditional methods. 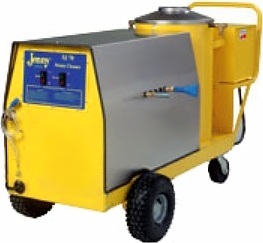 The SJ-70 delivers 100 to 200 PSI Max worth of super heated steam/water and soap making cleaning fast and easy. Common garden hose consumes about 240 Gallons per hour. The powerful SJ-120 only uses 70 Gallons of water per hour non stop use. Common garden hose consumes about 240 Gallons per hour. The powerful SJ-100 only uses 100 Gallons of water per hour non stop use. Common garden hose consumes about 240 Gallons per hour. The powerful SJ-120 only uses 120 Gallons of water per hour non stop use. Need something Drier? Want a machine that can deliver ZERO water waste? Check out our Vapor Rino 145 PSI Dry Vapor Steam Cleaning System here. 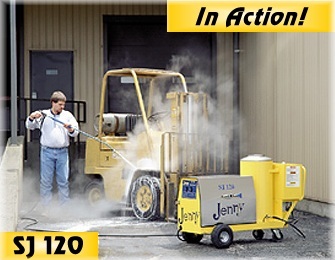 These 100% Portable SJ-Series are 2 way (Steam & Chemical Injection) wet steam cleaner systems. Even the beginner can learn to use this system in minutes with Its EZ push button operation. Just plug it in, connect your pressure hose, add the heating fuel, connect your water (a simple garden hose), and your ready to work! This unit has 2 output modes (steam & soap) and two spray patterns. Maximum of 325° F Super Heated WET STEAM at a flow rate of just 70 gallons per hour on up to 120! Flip a switch, drop the suction hose into a bucket of your favorite cleaning solution and you have a super heated chemical injected steam cleaner. The PSI on all the wet steam cleaners will vary in the ranges of 100 to 200 PSI. With wet steam, the real measure of power is heat and flow (GPH) rate. This 2 way system is a ruggedly built, industrial grade Chemical Injected 325° F super heated wet steam cleaning system! Pop on either of the two quick connect steam tips for either a focused flow or a flat spread of fast cleaning, sanitizing, disinfecting wet steam. These units also comes standard with a extra long 50' heavy duty hose & wand.